Preview personalization in campaigns using Subscriber Preview or by updating your Default Test List to include specific data. Both of these options are great ways to see how personalization (data fields) and conditional logic (dynamic tags) will display in your designs. In any email campaign you can review how your data fields and dynamic tags will display to a subscriber using Subscriber Preview. Go into your in progress email campaign, make sure you have a an email template and a subscriber list assigned to the campaign. Note: The subscribers that pull into Subscriber Preview are not filtered by any segments applied to the email campaign. Segmented is applied when the email campaign is sent. 3. Hover over the right side of an email address and select Preview. 3. Review the subscriber preview. Do data fields like First Name and Last Name display the correct information for your subscriber? Do dynamic tags display the correct conditional information for this subscriber’s data? You may need to send a copy of the preview to someone on your team to review before the email deploys. Since test emails by default won't contain the same personalization data that your list contains you may find it easiest to take a screenshot of the subscriber preview to send along to your reviewing team. First, in Chrome, download this extension "Full Page Screen Capture". 1. Search for the subscriber in Subscriber Preview and preview their email (follow these steps). 2. Right-Click on an image at the top of the email that appears. 6. Select "Open Link in New Tab"
8. A new tab will open containing a PNG screenshot that can be downloaded and emailed to the user! When you go to send a test email in any WordFly email campaign you'll notice that list data field (ex, Performance Name) personalization does not appear in test emails. This is because a test email uses data from the Default Test List which is made up of all the addresses you have available for testing. The test email is not using the list you have assigned to your campaign. Note: Since subscriber data fields (ex, First Name or Last Name) are saved to WordFly profiles you will always see subscriber data fields pull into test emails. 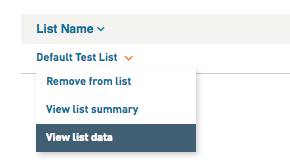 You can update your Default Test List to include specific list data so that your test emails display personalization. This allows you to send a personalized test email to someone on your Default Test List! 1. 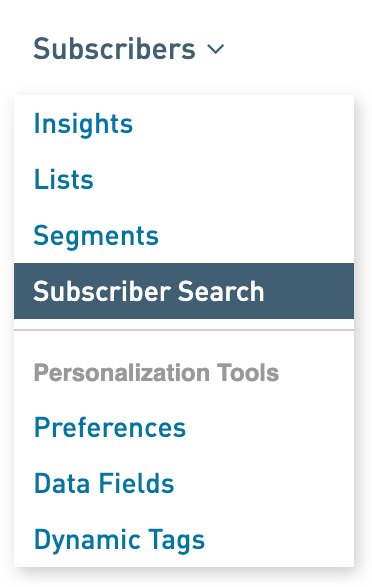 Search for your subscriber record in WordFly using Subscriber > Subscriber Search. You will search for one of the email addresses on your test list. This is the list that you see when you go to send a test email in any email campaign. 2. Select the Subscriber from the results. 3. From the subscriber's profile page, select the Lists section. 4. Find the "Default Test List" from the available subscriber to lists. 5. Click on the list name, and select View list data. 6. Customize the data here. 7. Save your list data updates. 8. Return to your email campaign to send a new test email. After updating test list data you can send a new test email which will show the data you customized!